Red Bull Racing is shaping up to take the fight to Mercedes and rob the Silver Arrows of a second Malaysian Grand Prix win in succession. Lewis Hamilton dominated qualifying, putting 0.4 seconds between him and teammate Nico Rosberg and 0.6 seconds between pole and the next-best car, Red Bull Racing’s Max Verstappen. The W07’s performance wasn’t curbed by the changeable temperature across the weekend’s Friday and Saturday sessions, which have been spread from morning to evening, and minor victories in the free practice time sheets were shared between Hamilton and Rosberg. Friday pace rankings strongly suggest, however, that Red Bull Racing’s long-run pace — an average time calculated over a number of laps — is on par, if not outright superior, to that exhibited by Mercedes, putting paid to any thoughts of an easy Hamilton victory. Ricciardo, who qualified fourth with a 0.047-second gap to his teammate, was more cautious in his assessment of the team’s race chances, however, and was more inclined to consider the threat from the Ferraris starting in fifth and sixth. Key to any Red Bull Racing challenge will be tyre strategy, and in this domain the team thinks it may have an ace up its sleeve — while every other top-16 driver progressed to Q2 using a set of soft tyres, Ricciardo and Verstappen both set their best time on the medium-compound rubber. Notwithstanding Verstappen completed an installation lap on his saved soft tyre, both he and Ricciardo will have a new set of the fastest compound available in a bid to execute the fastest race. 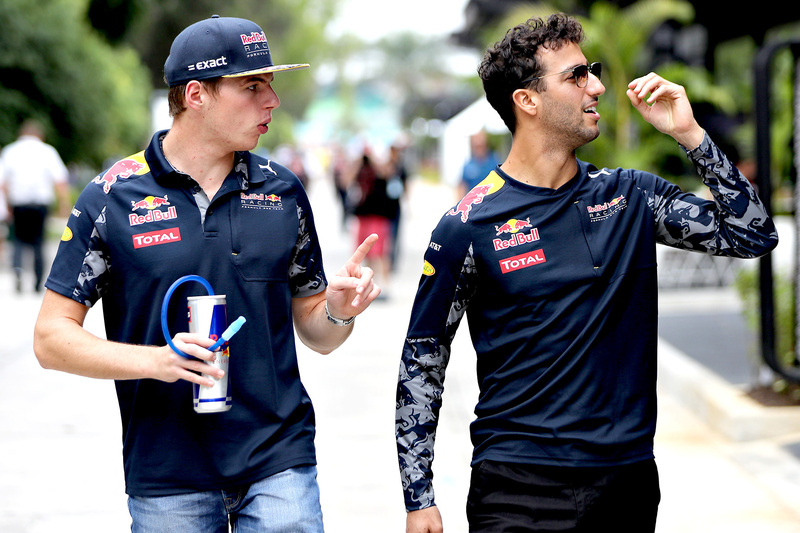 “We’ll just keep all the options open,” Verstappen said. “It felt quite a good balance on the soft tyres — actually on all the compounds it felt good on the long runs. Ricciardo hinted at Red Bull Racing’s preferred strategy, which will likely be combining the surprisingly effective hard compound with the saved soft tyres. Red Bull Racing’s forward-thinking approach to the grand prix contrasts with the situation at Ferrari, which snatched victory from Mercedes at this race last season, where the team is disappointed to have both cars qualify behind Red Bull Racing and enter the race without any strategic advantage. “Obviously we would have loved to have been ahead of the Red Bulls with both cars,” Sebastian Vettel said. “In the end we are behind with both cars, so not entirely happy. Neither Ferrari driver has any new tyres available to them bar one set each of the mandatory hard compound tyre. This compares poorly with both Mercedes drivers, who have at least one new set of hards and a new set of mediums each, and with both Red Bull Racing drivers, who have a new set of softs to correspond with their new hards. Vettel, however, insists that Malaysia’s difficult climactic conditions make trying to predict the best strategy tricky, putting no team at an advantage over any other ahead of the race. “I think conditions will be difficult to forecast, because the amount of cloud cover can make a big difference for track temperature, and I think that makes a difference on which compound works best relatively,” he said. “We all start on the same tyres, but then I think we could see some differences tomorrow in the race.